With the final Student Government Association presidential debate on Wednesday, March 21 in Bolin 100, the presidential candidates continue to insert themselves in the campus issues to show support for student interest. While the secretary and vice president candidates are running unopposed, two students are running for the presidential office position. According to Ellie Gunderson, political science junior, the current administration worked to unite the students after Robert Grays’ passing, and through that, Gunderson said she is wants to bring more organizations together, so students with different backgrounds can find support throughout the campus. 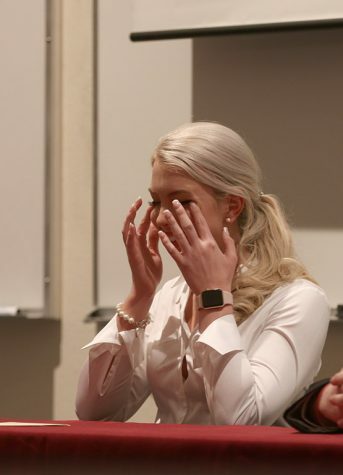 Each situation and case that the SGA hears extends further than just isolated incidents, and Gunderson said that unity encourages growth on campus, and if she is elected, she said she is excited to see what all she can accomplish throughout the year. As a former student athlete, Gunderson said she has learned how to manage her time and stay organized, and she said she will use those skills to further develop her platform. And while she spends time engaging on campus at sporting events and studies for her Law School Admission Test next fall, Gunderson said she’s fascinated by the the students’ resilience and said she hopes to the students can place their faith in her if she works for the students. “We all come from different backgrounds, and maybe you are an athlete or maybe you were from Black Student Union, we are still one, and I think that’s what our campus needs to work on, and I’m going to piggyback off their administration into this next one,” she said. Over the last two years, Steven Ehlert, criminal justice junior, has seen growth on campus that has encouraged him to run for SGA president. Ehlert said he’s excited to be a part of an organization that continues to strengthen the student body. Hearing people ask what SGA is or what they are doing has disappointed Ehlert because the “SGA was the top dog,” at his past community college. 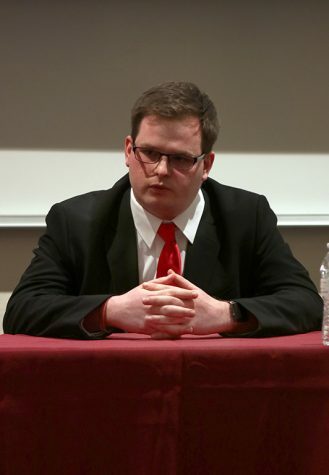 According to Ehlert, he plans to build off the strong foundation Maria Pena, SGA president, has laid out for the next president, and while the road isn’t going to be easy, Ehlert said he is up for the challenge. “It’s going to take time, I don’t think we are there yet, but we need somebody that is going to push and has had experience building organizations from scratch and building it all the way up, and that is a key aspect of what needs to happen,” Ehlert said. From the Carribean students affected by natural disasters to students affected by the conflict with the deferred action for childhood arrivals, Ehlert said the administration has sought out to make SGA known, and he said he wants to move a step further to invite students in to engage with the organization. So while he trains for his State Trooper exam either in the summer or in the fall, Ehlert said he will continue to focus on students first.